If you prefer to use your phone, laptop or other wireless device outside by your pool, you've probably faced connectivity problems from time to time. Wi-Fi extenders typically solve this problem but most of them aren't intended to be physically placed outside of your home. Netgear's Orbi Outdoor Satellite is one exception. This small, white device offers users 2,500 sq ft of extended Wi-Fi coverage and can be mounted on a wall or set up on its own anywhere you'd like - though, as the name suggests, it's primarily geared towards outdoor use. To reinforce this point, the device also features IP56 weather, dust and sub-zero temperature resistance. The Outdoor Satellite is Netgear's latest addition to their Orbi Home Wi-Fi device line-up - a set of Wi-Fi access points that include a hub system and a number of smaller "satellites" for use throughout your home. When combined, these devices work together to create a high-coverage "mesh network," allowing users to access the internet via one dedicated network, eliminating many of the headaches you might face with traditional Wi-Fi extenders. 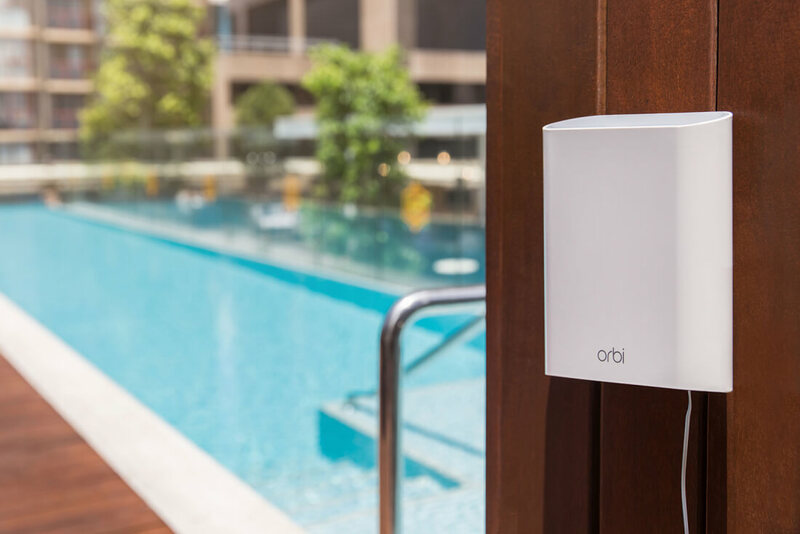 To be clear, the Orbi Outdoor Satellite will not work as a standalone home network system - it's only available as an add-on to the full Orbi Home Wi-Fi system. As of writing, the full kit ranges from $250 for a set with 3,500 sq ft of coverage to about $550 for a system with 8,000 sq ft of coverage. If you already own one of the base systems and simply want check out the Outdoor Satellite add-on itself, it's available via various official third-party resellers for around $330.